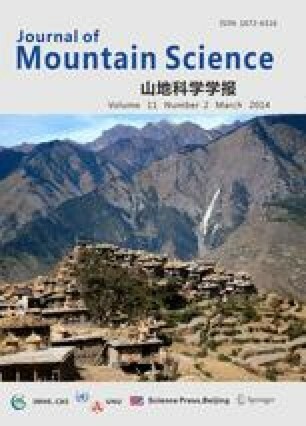 The present paper gives an insight into the distribution and use pattern of medicinal shrubs in Uttaranchal State. A total of 222 medicinal and aromatic shrub species have been appended based on secondary information. Euphorbiaceae, Rosaceae, Verbenaceae, and Fabaceae have the highest representatives of medicinal shrubs. Twenty one families had one species each in medicinal use. Verbenaceae and Euphorbiaceae in the sub-tropical region, Rosaceae in the temperate region, and Ericaceae and Rosaceae in the sub-alpine and alpine regions, respectively, had the highest representatives of medicinal shrubs. The distribution of medicinal shrubs was 42 % in sub-tropical, 29 % in warm temperate, 13 % in cool temperate, 9 % in sub-alpine and 7 % in the alpine region. Of the total species, 70 medicinal shrubs were native to the Himalayas and 22 native to Himalayan region including other Himalayan countries. The most frequently used plant parts for various ailments were leaves (31 %) and roots (23 %). Most shrubs are being used for the diseases, viz. skin diseases, dysentery, cough, fever, wounds, and rheumatism. The present paper will help in the execution of strategies for promotion and cultivation of medicinal shrubs in Uttaranchal State.